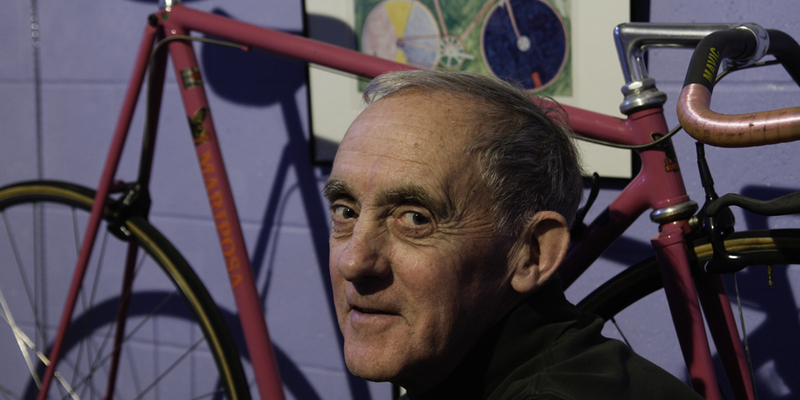 Story about Greg Curnoe by Michael "Mike" Barry, the man who built his bicycles. Originally published in dandyhorse Issue N° 2, Spring 2009. It was in 1974 that the celebrated artist from London, Ontario, Greg Curnoe, came to our store, Bicyclesport on King Street in Toronto. He was obviously very interested in cycling and very knowledgeable about bikes. Greg was also an avid nationalist and he was delighted to discover that we were building custom bike frames on site. He had been looking for a Canadian-built racing bike for some time. Since the demise of CCM’s custom frame building shop where they had produced the Flyer model, there had been no one else in Canada building custom frames. Greg immediately ordered a Mariposa. 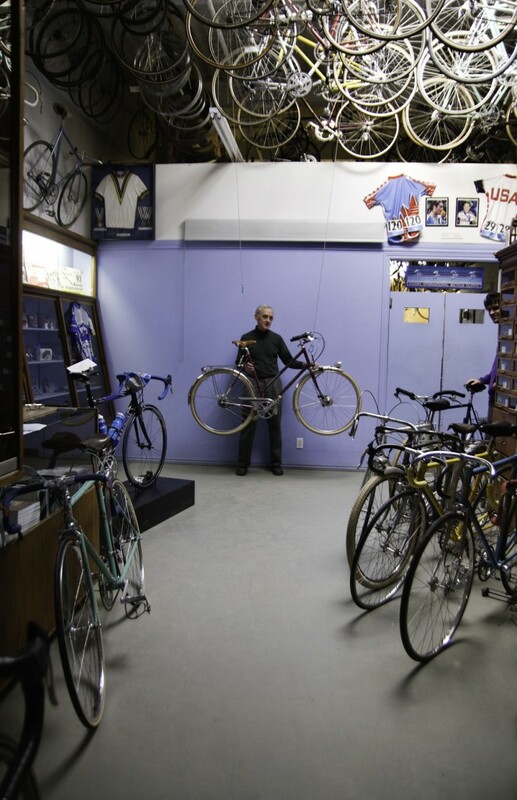 Before coming to Bicyclesport Greg had owned a couple of racing bikes; a Spanish Zeus and a French Gitane. Both bikes are featured in his artwork. There are two paintings of the Zeus – a head-on painting and a side view – in acrylic on plywood. Both paintings are designed to stand against a wall as one would lean a bike. Both are now in the Art Gallery of Ontario. Greg claimed that he was in no way anti-American but, instead, very pro-Canadian. This sentiment was exemplified when he was commissioned to paint a mural at the Montréal airport for Expo ’76. The mural contained depictions that many construed as anti-American. Greg argued that they were just pro-Canadian but the authorities disagreed and the mural was completely painted over to prevent the possibility of offending American visitors. Greg raced on his Mariposa for a couple of years before he was involved in an accident which bent the frame’s top and down tube. He returned it to us at Bicyclesport for repair and at the same time ordered another Mariposa, this time a dedicated time trial bike. He was quite unlucky with his Mariposas. The second one was also damaged in an accident involving a car. Fortunately this accident occurred after Greg had painted what has become his most famous bicycle painting, a full-size watercolour entitled “Mariposa T.T.” This painting was then printed as a limited edition on Plexiglas. The original watercolour is now in the Musée d’Art Contemporain de Montréal. The bike was again returned to us for repair. At that time, around 1981, low-profile time trial bikes were becoming popular. It was agreed that if we were changing the top and down tubes anyway we may as well convert the bike into a low-profile style machine. The frame was altered and “cow-horn” handlebars were fitted. The new paint scheme was pink rather than the original bright green. Greg painted another watercolour of it entitled “Mariposa Low Profile,” which is featured on the cover of this magazine – dandyhorse Issue N° 2, Spring 2009. In 1992 Greg was killed when a pickup truck drove into a group of London Centennial Wheelers club riders. That morning we lost not only one of Canada’s most prominent artists but also one of the nicest, most cheerful persons one could meet. 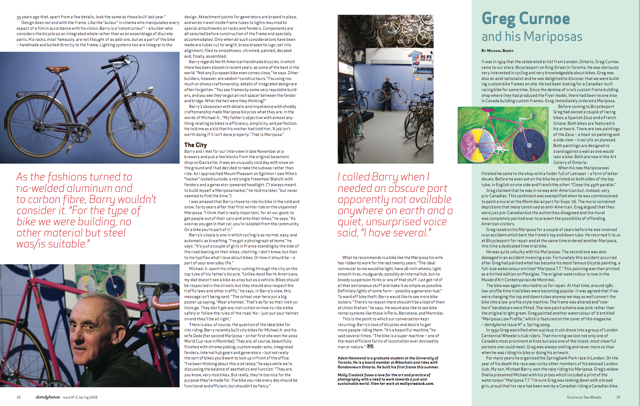 Greg was always smiling and never more so than when he was riding his bike or doing his artwork. For many years he organized the Springbank Park race in London. On the year of his death the race was run by other members of his beloved London club. My son, Michael Barry, won the race riding his Mariposa. Greg’s widow Sheila presented Michael with his prizes which included a print of the watercolour “Mariposa T.T.” I’m sure Greg was looking down with a broad grin, proud that his race had been won by a Canadian riding a Canadian bike. 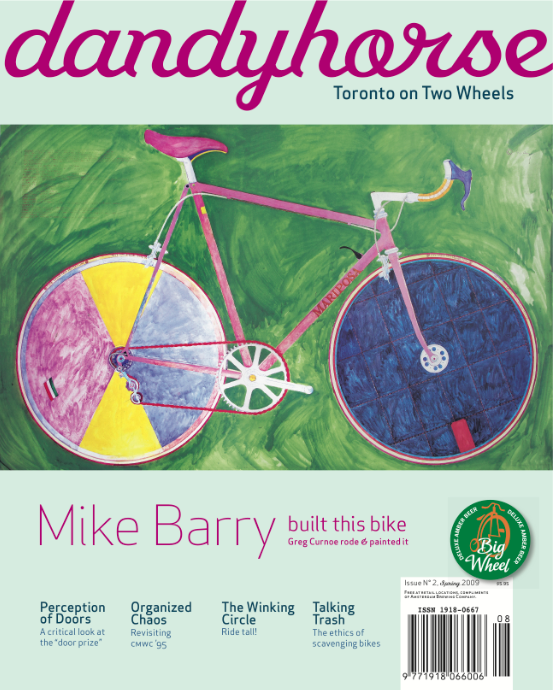 Michael "Mike" Barry is co-founder of Mariposa whose custom bicycle frames were crafted in Toronto from 1970 to 2006. 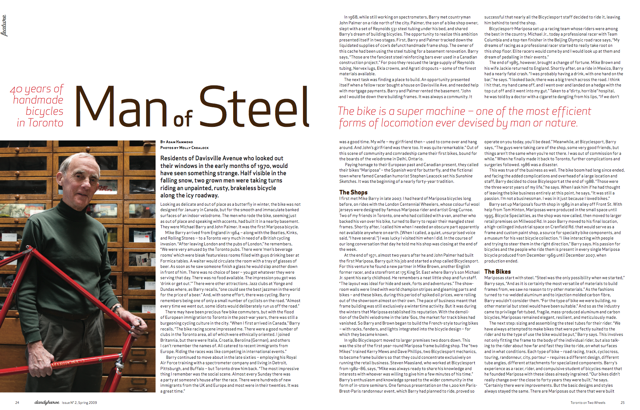 Read Adam Hammond's profile of Michael Barry the "Man of Steel" in dandyhorse Issue N° 2, Spring 2009.